The popular Sx2 dongle is now also available in a version especially for E Bikes with Shimano STEPS E8000 mid-mounted engines (but without Di2 electronic gearshift). This tuning tool removes the 25 km/h speed limitation and increases the motor support up to 50 km/h. You can comfortably activate the inserted dongle via the light switch of the E bike. As there is no direct intervention in the engine electronics, all Shimano riding modes are retained. Easy connection thanks to "plug & play" principle: The Sx2 dongle is housed in a compact jack plug, which you simply have to connect to the motor of your Shimano STEPS E8000 pedelec using the supplied cable set. An extra battery is not required. Thanks to the encapsulated electronics, the Sx2 dongle is robust and fully suitable for outdoor use. The Sx2 dongle works by dividing the transmitted speed from approx. 20 km/h by 2, which in turn doubles the maximum motor support. Please note that due to this functional principle your E Bike display will only show half of the real speed when the tuning is activated. Please indicate the wheel diameter of your Shimano E8000 electric bike when ordering. The Sx2 Dongle is available for 26", 27,5" / 28" and 29" wheels. The Sx2 dongle is also available in a version especially for Shimano E8000 E bikes with the speed sensor at the wheel hub. - If you want to use this tuning tool, the light function of your E Bike has to be unlocked. The light function can be activated at any time by your E Bike dealer or in your local bicycle repair shop. They should have appropriate equipment. - The Sx2 dongle only works on E bikes with Shimano STEPS E8000 motors that do not have a Di2 electronic gearshift. The Sx2 dongle comes with a “plug & play” cable set with original Shimano connectors especially for Shimano STEPS E8000 engines. 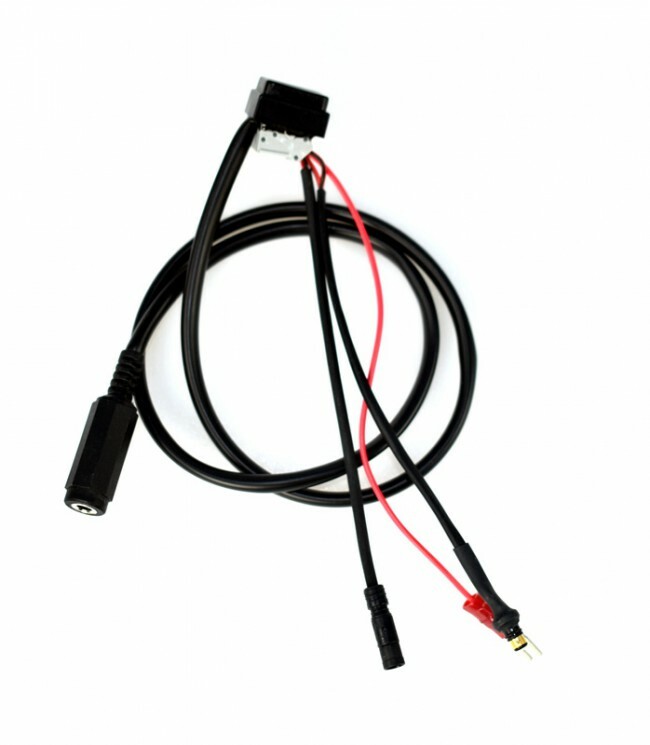 The cable kit consists of a cable with a cable lug and a plug and play coupling connector. Then you have to disconnect the speed sensor plug of the motor and connect it with the plug of the cable set. Then insert the coupling connector into the speed sensor socket at the engine. Screw the red wire with the cable lug to the (+) line of the light connection. Now you should carry out a function test: Activate the light on the display, put on the chain, jack up the rear wheel and slowly turn the pedal by hand. Observe whether the speedometer display is working. When the display indicates the speed, repeat the procedure with the Sx2 dongle inserted. Now the displayed speed should jump back to half the value at a speed between 12 and 25 km/h. If this is the case, you have connected the dongle correctly. Reassemble everything and reattach the stone chip protection. Make sure that the cable kit is fastened in a way that the coupling and the plugs are protected from splash water and cannot get caught.